The Chicago Old Main Post Office, located in West Town and originally constructed in 1922, has remained quietly empty for more than twenty years. Since 1997, when the US Postal Service left the building, it has been the city’s largest vacant real estate asset. This is finally changing, however, as nationwide pharmacy and grocery chain Walgreens will become the first tenant. This represents a move by the company to return to its Chicago roots, as it began over a century ago with a single storefront on the south side of the city, and will be Walgreens’ first presence in West Town. This comes after a years-long revitalization drive led by New York-based real estate developers 601W after they purchased the massive property in 2016. Walgreens will be bringing over 1,800 employees to the heart of the city, largely moving those who work in their technology-oriented departments. This will add significantly to the 4,500 employees they already employ in Chicago, and will do more to make not only the city the center of their Midwest operations, but also a nationwide emerging tech hub. This announcement comes on the heels of Google and McDonalds putting their headquarters in nearby Fulton Market in recent years, and many more innovative companies moving tech operations to Chicago. It is not surprising why Walgreens chose the venerable Chicago Old Main Post Office as a headquarters. With abundant cavernous empty floors, a central location just west of the Loop, and a regal façade in the art deco style, it embodies stability and elegance. The art deco style was just hitting its stride in mainstream architecture when the post office was constructed, and is reflected in the building’s combination of a somber stone body and opulent gold detailing in the windows and inside of the lobby. Walgreens’ move into the Chicago Old Main Post Office is only one part of a larger story of the West Loop’s growth. While many speculate that Walgreens’ move into the post office has crossed that site off the list of possible Amazon headquarters locations, there are many other reasons to believe that the West Loop is an emerging powerhouse in Chicago. According to Curbed Chicago, there are no fewer than 52 currently developments proposed or under construction in the West Loop, largely in the categories of office space or luxury rentals. In the midst of this flurry of development, Walgreens is sure to add its own distinctive footprint to the area. With their move into the post office, they will also replace thousands of windows, completely overhaul the lobby, and also build a rooftop terrace – for an estimated price tag of $600 million. They will also engage the community by investing in neighborhood development such as a public river walk, and other minor elements of beautification for the public space that surrounds the post office. 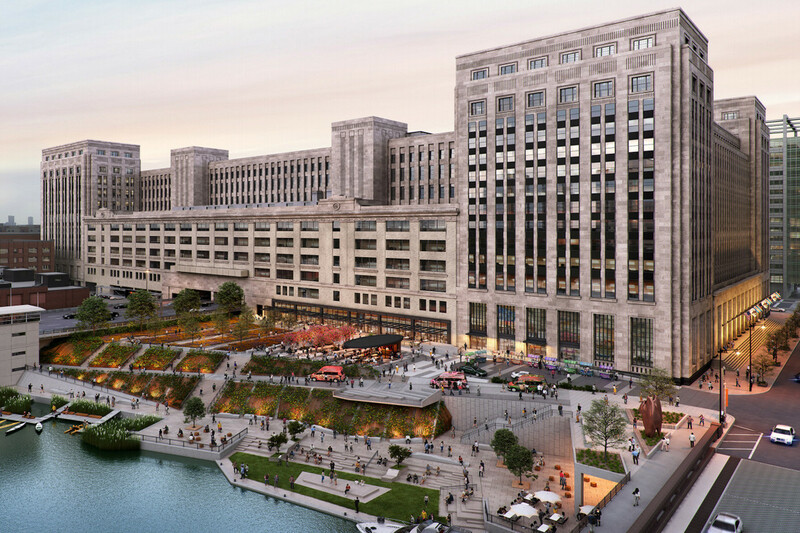 This news is sure to inject new life into a historic landmark, and only push forward the rise of the West Loop as a center of economic and social life in Chicago.